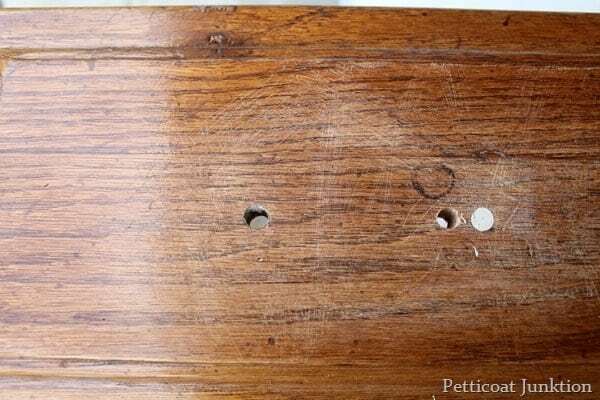 I’m going to show you how to replace furniture knobs where the center-to-center measurement of the old hardware is different from the new hardware. To put that in regular language….you can’t screw the new knobs to the furniture because the screw holes are not the right distance apart. 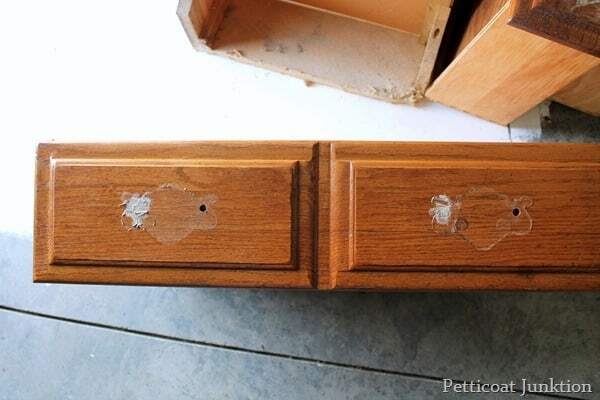 You will need to fill the original screw holes with wood putty and drill new holes for the replacement hardware. You can do this, it’s not that hard. You do need a drill and if you don’t have one already you can buy a cheap one for less than $25. 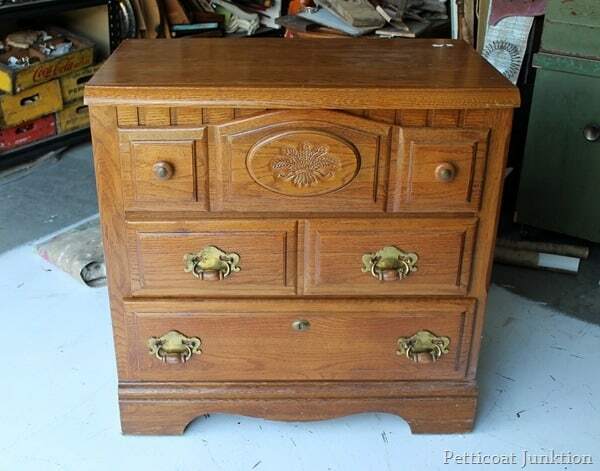 The furniture knobs are a really, really, important part of any furniture makeover. The style of knobs is going to dictate the feel of the finished furniture project. Take the nightstand in the photo above. The details and the furniture pulls scream country and outdated. 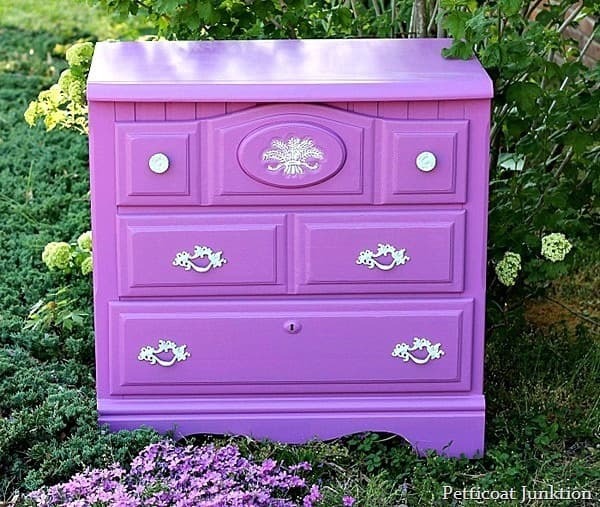 The same piece painted Radiant Orchid with the addition of new feminine hardware is hardly recognizable. No more clunky hardware and stained wood. Now let’s talk about how to change out those knobs. Step 1. Select the new furniture knobs. I knew I wanted to change the hardware on the small nightstand so I went through my hardware stash and came up with these beauties. I was going for a feminine French Provincial look and these were perfect. I know most of you don’t have a hardware stash like mine but you can buy new hardware at Hobby Lobby and home improvement stores or order from online sites. The major problem you run into when replacing hardware is finding some with the correct screw hole width to fit what’s there. I think the correct term is “measuring on center” or “center-to-center measurement” or something similar. The most common size hardware is 3” on center…but most antique hardware is not standard size. 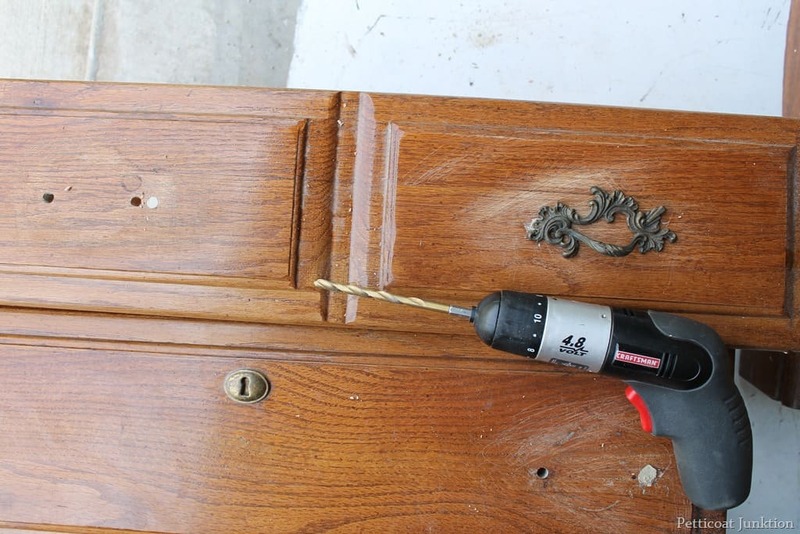 The drawer pulls I selected for this makeover was smaller on center than the original so I had to putty up one of the screw holes for each hardware piece and drill one new hole for each piece. No need to drill two new holes usually. Try to use one of the original holes. Step 2. 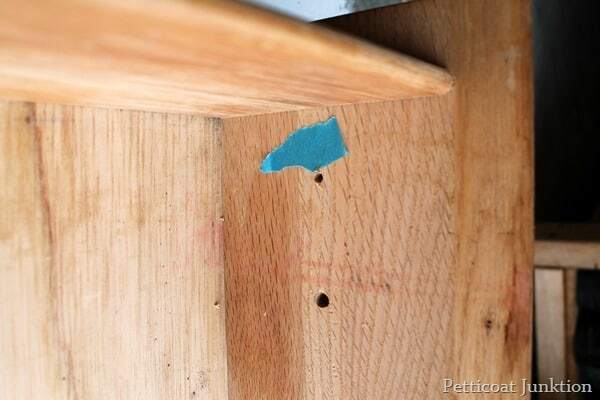 Fill screw holes with wood putty. As I just mentioned use one of the original holes so you don’t have to fill two holes and drill two new holes for each pull. You just need to decide which hole to fill. The end result is two holes closer together than the originals. As you can see here…I filled the wrong hole on one side. Oh well, I did catch my mistake so I just knocked the filler out and filled the correct hole. I make all kinds of screw-ups ya’ll never find out about. I used Elmer’s wood filler to putty the unneeded holes. One thing that’s very handy is to put a piece of tape on the inside of the drawer over the hole you’re filling. The tape prevents the excess filler/putty from seeping into the inside of the drawer. You also use less filler this way. Step 3. 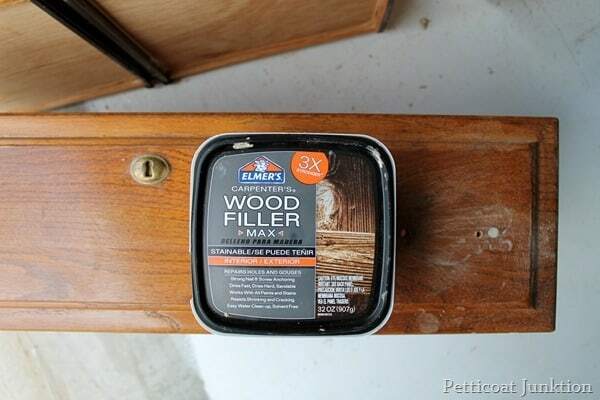 Sand wood filler. When the wood filler is dry it’s time to sand off the excess. I use 100 grit sandpaper by hand to do the sanding. Sand the filler flush with the drawer front. When you are finished sanding there may be a little depression where the filler shrunk as it dried. 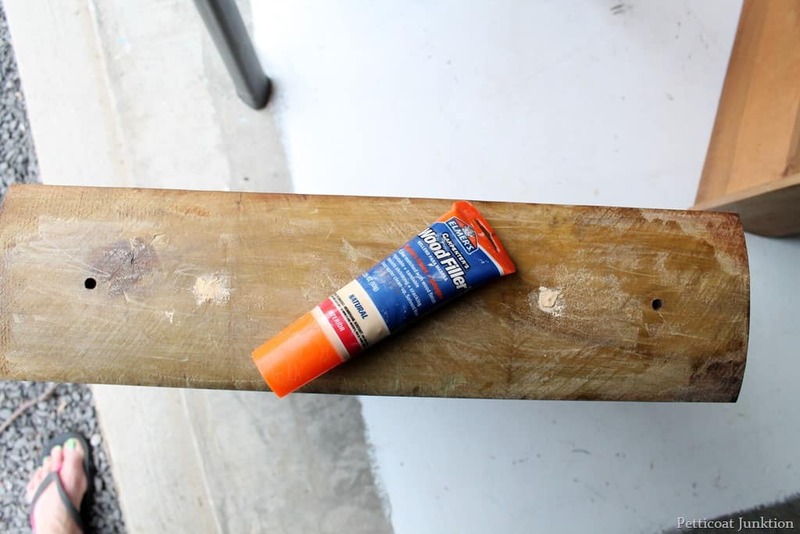 If there is… put a little more wood filler over it then sand when dry. That should do the trick. The photo above shows a different furniture piece entirely(Extreme Furniture Makeover)…I used Elmer’s Wood Filler in the tube. I like the filler in the tube because it’s much easier to get it in the screw holes without a lot of excess. Step 4. Drill new hardware holes. Next step is to drill the new screw holes. 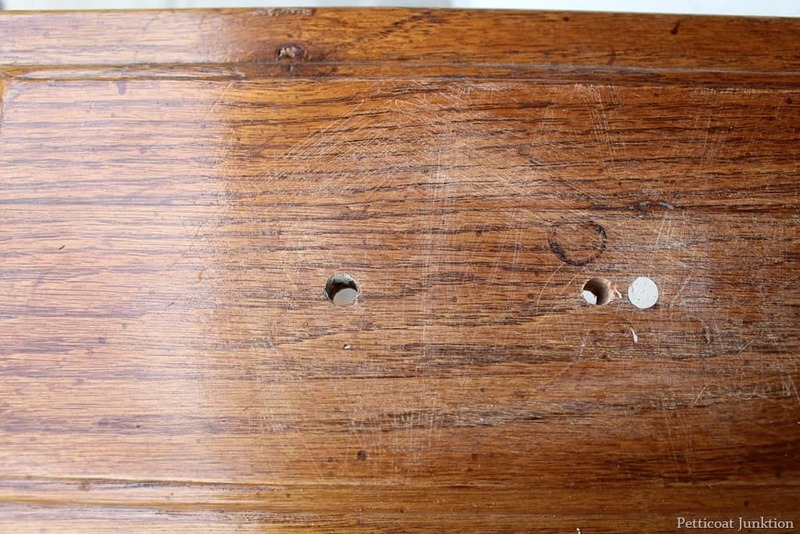 You need to lay the hardware pull on the drawer and mark with a pencil or pen where the new hole should be. They have handy dandy cabinet hardware templates that make this job much easier but I keep forgetting to buy one when I’m at the hardware store. 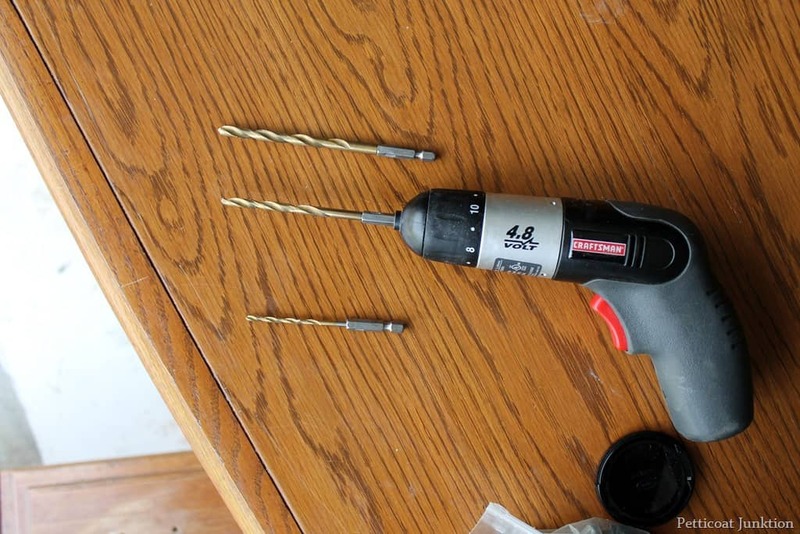 I use a cordless drill because they are easier for me to work with. I begin with a small drill bit to start the hole then move up in size till I get the size screw hole I need. I usually use 2 or 3 drill bits. You can always start with the size bit you think will do the job if you prefer. Don’t be scared of the drill! They are really easy to use. Here’s the new hole and the filled hole…..all nice and neat. Always drill the new holes before painting because you may scuff up your new paint finish if you wait. Step 5. Add the new furniture hardware. This is where I inserted the replacement hardware so you could see how well it fit. One other thing to mention is it’s always nice if the replacement hardware covers the original holes, then you don’t have to fill them. Sometimes that does happen. 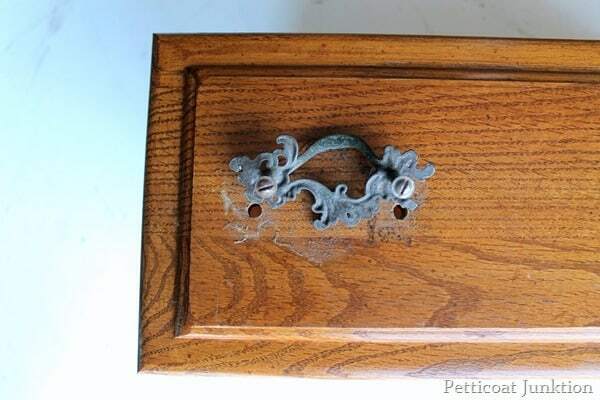 The hardware curves and decorative details will be wide enough to cover the original holes so you don’t see them. 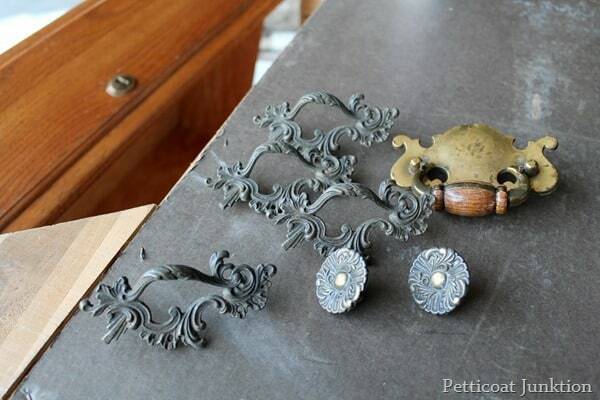 You can replace furniture knobs on any piece of furniture. You don’t have to paint it or do any major changes either. 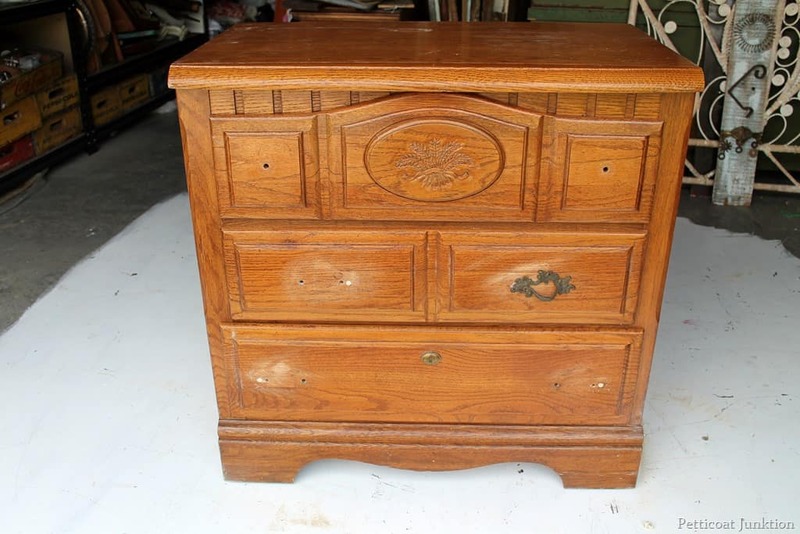 Sometimes just changing out knobs makes a big impact and brings a piece up to date. Ok guys, if you didn’t understand all that just email me with your question. 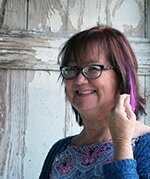 Sometimes it’s hard to explain the process in writing. At least for me. disclaimer…I am not a professional…. so just go with it. You can see the paint details on the project here…Radiant Orchid Paint For Furniture. update: I posted about adding a single new furniture knob in place of a handle/pull here…Update Furniture Hardware. 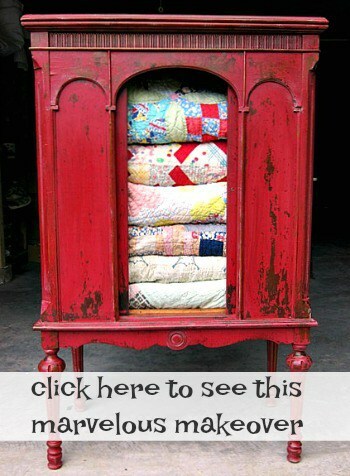 This project originally appeared on Petticoat Junktion in May 2014. Details and photos have been updated. Great information, Kathy. Hope I can remember to look it up when I want to use it! I think what you did to the dresser is very pretty, I have never tried this and when I was a kid I remember we have these types of wardrobes and sets of draws as the one you refurnished. I feed gutted that I let my mother throw them away back in the day. 🙂 nice work and thank you for sharing your wonderful talent with us all. Now all I need is a decent piece of furniture to paint!!! Oh, I forgot, I have one already…I just hate sanding…thanks for the hardware tutorial! You are awesome! Lot’s of great information. Very helpful. I love the part where you tape the inside of the drawer so that the wood fill would not get inside. Thank you. THANKS FOR ALL THAT INFORMATION ON LINING UP THE HARDWARE HOLES. 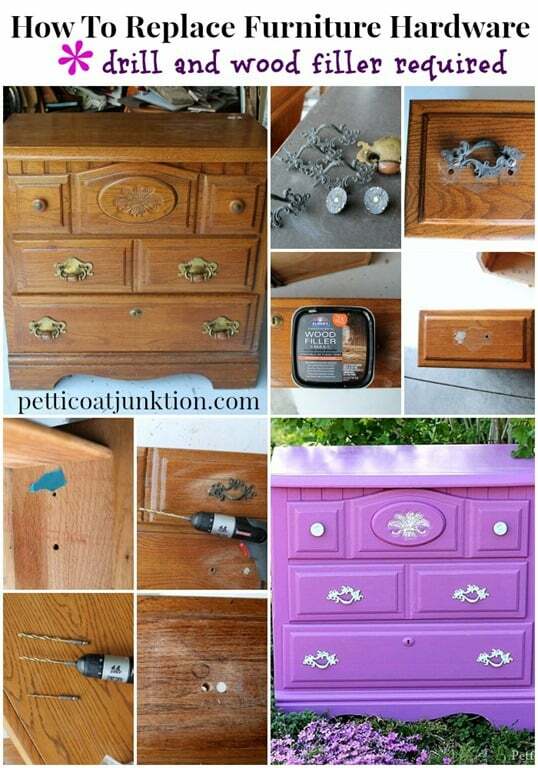 Very good tutorial, love that little dresser, great job.